Ever find yourself with some random veggies and no plan? That happens to me all the time. I think it’s a fun “problem” to have, because then you have to get creative. 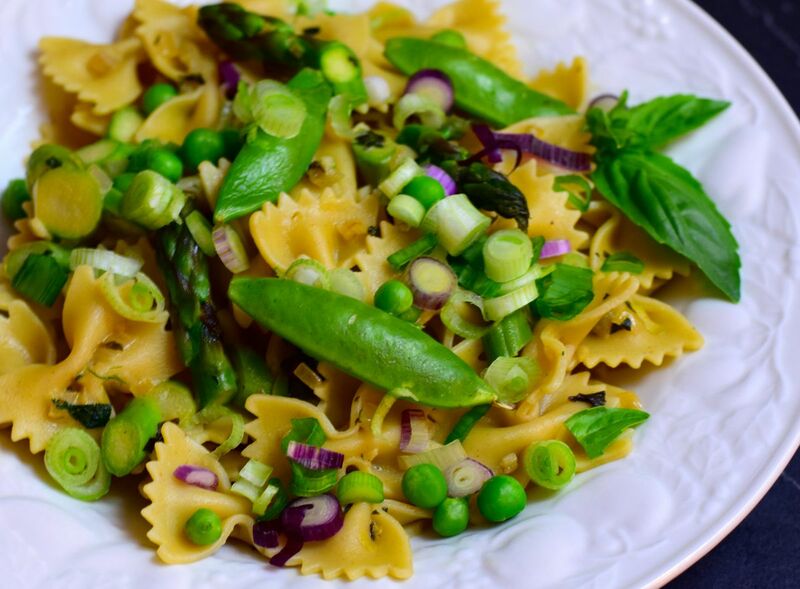 I was perusing the New York Times Cooking website, which I love, and came across a recipe for Pasta Primavera with Asparagus and Peas. It looked so pretty! But I didn’t have everything that recipe required, so I invented my own. Here it is! It’s a light and refreshing summery take on pasta with crisp green veggies, just enough sherry-cream sauce and a little lift from fresh herbs. Equipment: Large pot and colander for cooking and draining pasta; large sauté pan with lid for sauce. ½ c. sliced scallions (more or less) - I had some lovely red scallions from my CSA (community-supported agriculture) box - you can see them in the photo! Prepare water for cooking pasta: Fill a large pot with salted water, heat over high heat, and bring to a boil while you prepare the rest of the recipe. Once water is boiling, add pasta and cook according to package directions. Prepare sauce: In a large sauté pan, melt the butter over medium-high heat. Add the onion, garlic, and scallions, lightly season with sea salt & freshly ground pepper, and sauté until fragrant and onion is starting to soften, 3-5 minutes (but don't let the garlic burn). Add sherry or wine, veggie broth, and half-and-half, bring to a boil, turn down heat a bit, and continue simmering until sauce thickens, about 5-8 minutes. Add veggies to sauce: Add asparagus and sugar snap peas; cover and cook over low heat for 3 minutes. Stir in frozen peas and simmer 1-2 minutes more, until veggies are crisp-tender but still bright green. Stir in fresh mint and basil. Taste and add sea salt & freshly ground pepper if needed. Assemble your dish: Once pasta has finished cooking, drain using colander (saving some of the pasta cooking water - I put a heatproof measuring cup in the sink while I'm draining it for this purpose) and place pasta back in its pot. Over high heat, pour the sauce over the cooked pasta, and cook while constantly stirring for 1-2 minutes to marry the pasta and sauce together. If more moisture is needed, splash with pasta cooking water until it's saucy enough for you, and continue cooking and stirring over high heat until gently sizzling. Turn off heat, taste and add sea salt & freshly ground pepper if needed. Serve with additional fresh herbs or scallions as garnish if desired, and freshly grated Parmesan cheese. Enjoy!